Semi-centennial History of the Illinois State Normal University, 1857-1907, “THE SCHOOL AND THE WAR,” BY JOHN H. BURNHAM, CLASS OF l861, (1907). John A. Burnham, who was a member of the 33rd Illinois from Normal, provides an interesting account of the Battle of Bayou Cache, also known as “Cotton Plant.” As most of you know, I have written extensively on this battle in both my book, and an article that I have submitted to the Arkansas Historical Quarterly. This particular account popped up just recently on google books. The Normal regiment found itself at Pilot Knob, Mo., September 20, 1861. Here and near here its officers and soldiers were taught many of the important first lessons in soldiery and military tactics. it was seen that we were always ready to prove by acts and not by words that we were in the war for the good of the cause, and not to promote our own selfish interests. It was not long before we were proud of our comrades, and our comrades were proud to be associated with those who had originated the idea of the schoolmaster’s regiment. Its first baptism of fire was at Fredericktown, Mo., October 21, 1861, just enough like war to give us a slight zest for more, not a man killed, not a drop of the Regiment’s blood spilled, and the victory was important. In camp at Ironton, Mo., during the winter of 1861 and 1862, our regiment suffered from sickness but gradually improved itself in military drill, and perfected itself in hard marching during the following spring and summer. 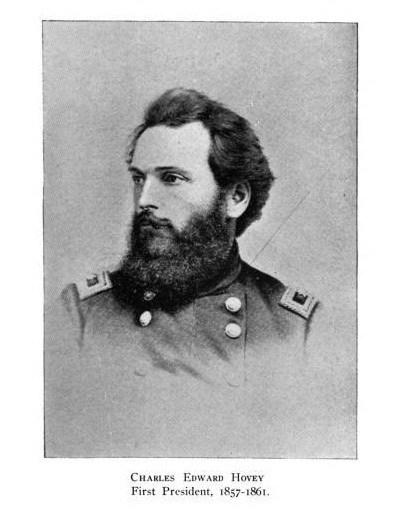 Colonel Hovey won his promotion on this march, which is the main reason for the insertion of a brief account of the battle of Bayou Cache, July 7, 1862. Our regiment formed a part of the advance guard of General Curtis’ army of 15,000 men, marching thru Missouri and Arkansas on the way to Little Rock. The Rebels, for several days, obstructed our march by felling trees in the roads and in other ways, without giving us fight. On the morning of July 7, four companies of the 33rd regiment, with as many more from the 11th Wisconsin regiment, were reconnoitering in advance, removing the blockades, when we fell into an ambush of Texan rangers. His descriptions offers some detail that other reports did not provide, though he essentially, as has been the case, follows only the exploits of the 33rd Illinois Regiment at the expense of the 11th. Now, this, of course, is not unusual. Mr. Wehner: My name is Terry Beckenbaugh and I am currently a professor at the US Army Command & General Staff College at Fort Leavenworth, Kansas. I am working on a book focusing on the White River Campaign in Arkansas in 1862. I read your book on the 11th Wisconsin, and noticed that you have quite a few primary sources that are listed as “author’s collection.” Is there any chance I could get a peek at some that discuss the 11th Wisconsin’s participation in that campaign? While I will talk about the Battle of Bayou Cache, it is not the focus of the book. I’m focusing on the role of the Army of the Southwest in freeing slaves, and why it the soldiers did so. My dissertation focused on MG Sam Curtis and the role his views on race played in his relegation to ever-more obscure posts after the White River. I will be visiting Madison to do research in a few weeks. Thank you for your time.